South entrance to Fountain Crest, a mixed-use garden immediately north of the funeral home. Fountain Crest provides opportunities for estate planning using either traditional ground burial, private mausoleum entombment or a wide array of cremation options. All three options can be combined in one estate. Memorial Park Funeral Home and Cemetery was founded by Memphis businessman E. Clovis Hinds after returning from a visit to Forest Lawn Memorial Park in Glendale, a suburb of Los Angeles, California. Hinds was inspired by the idea of cemeteries as beautiful green spaces instead of the traditional graveyards of the time. He was determined to establish a facility in Memphis that would serve as a testament to both the glory of nature and the wonder of art. Hinds wanted the people of Memphis to have more than a focal point in times of bereavement. His vision was of a beautiful place in which to feel inspired and spiritually uplifted. He would achieve his goal by creating a setting of beautiful pools and fountains, broad driveways, spacious lawns, beautiful trees and flowers. family estate garden offering traditional burial or cremation inurnment options. In 1925, Hinds realized his dream. 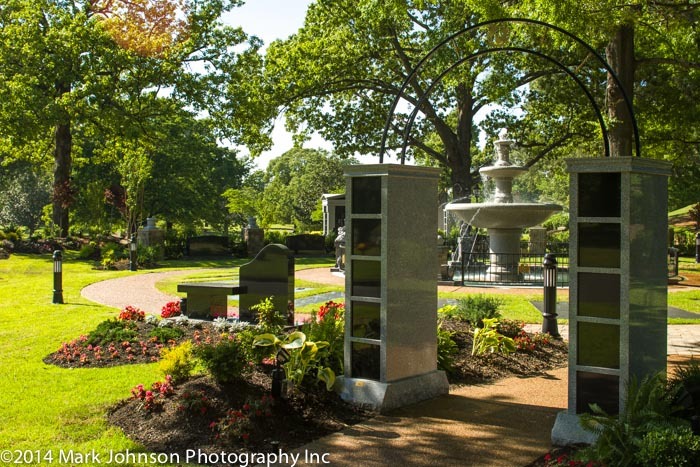 Situated on 152 acres in East Memphis at the intersection of Poplar Avenue and I-240, Memorial Park is the only location in the area with a cemetery, crematory, and funeral home all in one location offering families peace of mind and convenience. 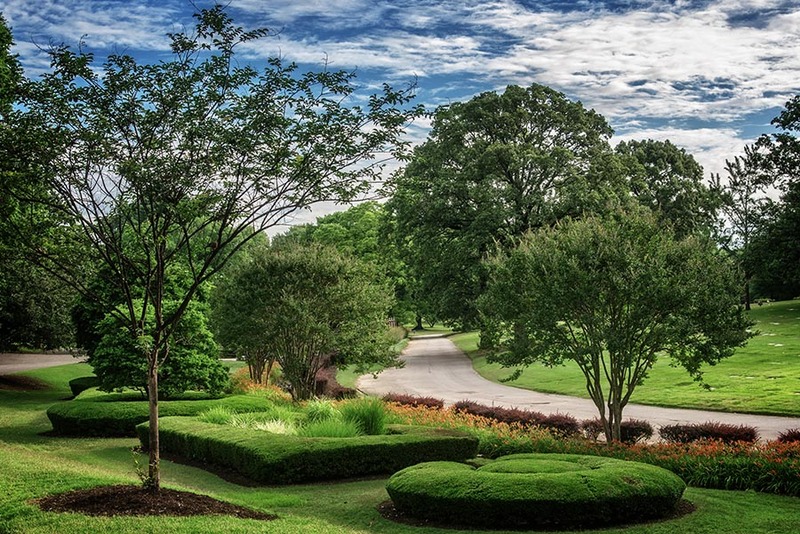 For most of its history, Memorial Park remained family owned, eventually passing to Hinds’ granddaughter Katherine Hinds Smythe, a towering figure in her own right within the industry and the Memphis community. Today, Memorial Park is privately owned and operated by Northstar Memorial Group. Memorial Park is heavily influenced by the works of Mexican artist Dionicio Rodriguez. Pictured are two of his works, Abraham’s Oak stands in the foreground with the Crystal Shrine Grotto in the background. 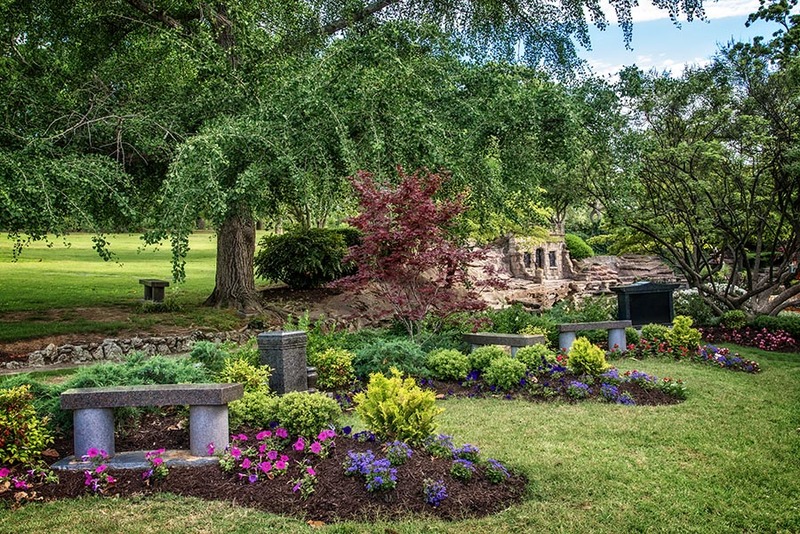 As the most-selected funeral service provider in the Mid-South, Memorial Park is proud of its reputation for quality, sincerity, and trust, with services that celebrate the life of each individual and respect the wishes of every family. The enduring legacy of the founder is Memorial Park’s dedication to helping families who have experienced a personal loss. The facility’s mission is to prepare families for what’s next, and to guide them through the full range of funeral service, cremation, and memorialization options at Memorial Park. Nothing is more personal than laying a loved one to rest, and there is no greater honor than reverently caring for the final resting places of those who have passed on. At Memorial Park, every detail is handled with a personal approach rarely experienced anywhere else in the profession. A diverse selection of offerings is designed to make the journey as effortless as possible, and Memorial Park’s Signature Services™ help make each service as special as the person whose life and legacy are being honored. Grotto Estates, a premium cremation estate area sits on the border of the Pool of Hebron with the Cave of Macpelah in the background. The tranquil sounds of the fountain and the lush landscaping create an atmosphere of tranquility. 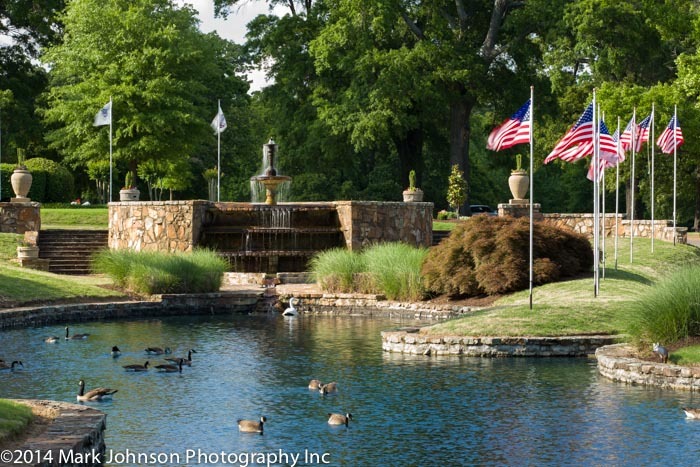 Among Memorial Park’s many outstanding physical features is a gracefully curved reflecting pool and three-tiered fountain at the entrance. Stone bridges and other fascinating structures were crafted by Mexican artist Dionicio Rodriguez. 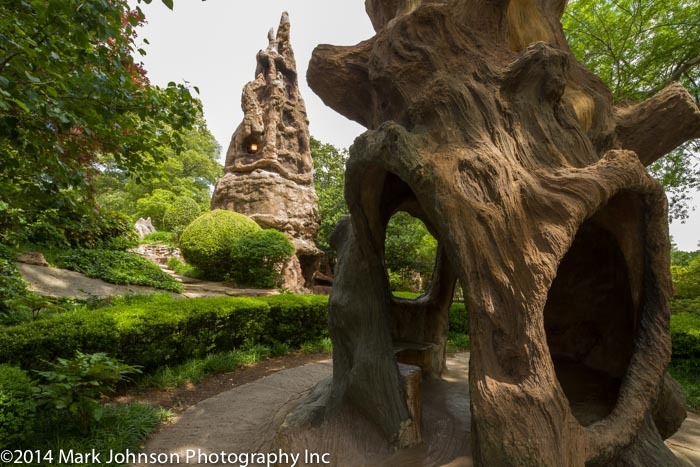 Among his most noted creations is the Crystal Shrine Grotto, described as the only man-made crystal cave in the world. 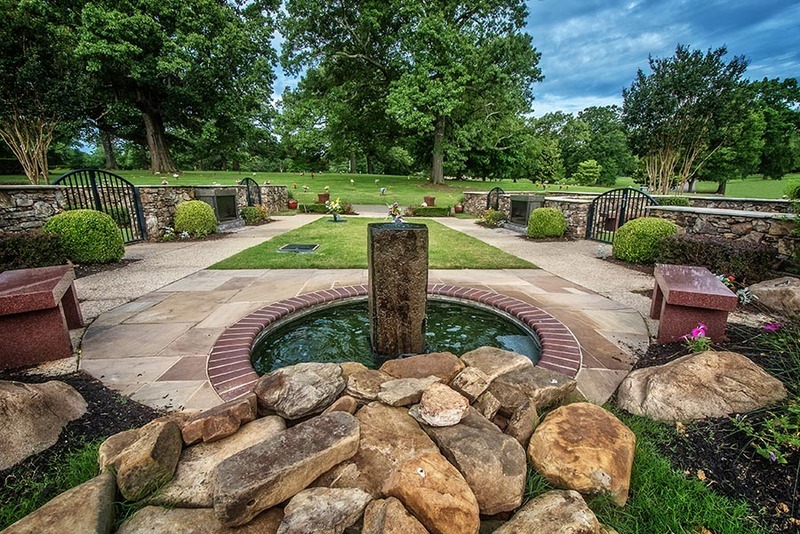 The Annie Laurie Wishing Chair and Rose Garden, the Wishing Well, and the Fountain of Youth also lend their beauty to the area. The on-site funeral home was added in 1977 and offers two chapels. With seating for 400 people, the Riverside Chapel is the largest in the area, while the more intimate Fireside Chapel seats 125. Complementing the chapels are two well-appointed visitation suites, along with Parkside Event Center, which offers reception and service options for today’s modern funeral services. “In addition to our beautifully landscaped, heavily wooded, rolling hills and the many features throughout the facility, Memorial Park is known for delivering white glove service in a warm, familial manner,” states Richard Williams, Memorial Park’s Chief Promise Keeper. “We combine unparalleled professionalism with sincere compassion and a deep desire to serve. While professional, we serve from the heart, treating each family we serve like a longtime family friend. Throughout Memorial Park, you see many garden areas that fulfill the founder’s vision of creating a spiritually uplifting greenspace. Attesting to Memorial Park’s reputation for having enhanced the already stunning natural beauty of the area is the fact that the facility has become a powerful magnet for visitors. Each year, tens of thousands of people visit Memorial Park specifically to immerse themselves in the beauty and tranquility of Crystal Shrine Grotto. The area is also the preferred backdrop for many local photographers as the setting for family photographs.